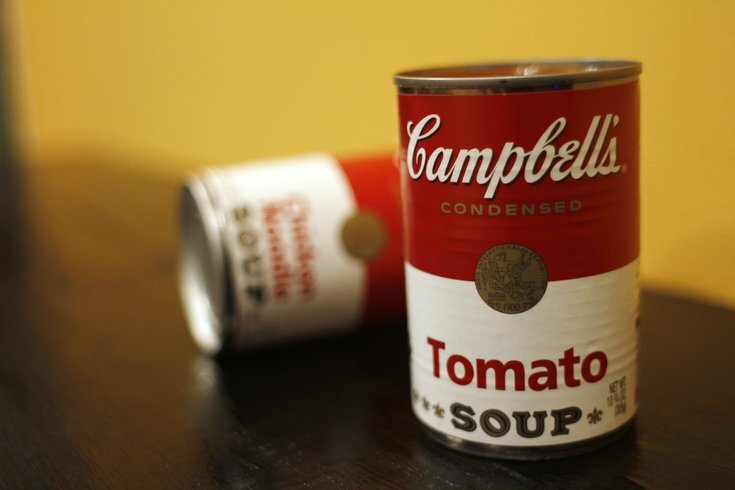 This Aug. 31, 2011 photo shows two cans of Campbell's soup in New York. Organic Goldfish crackers and condensed soup with no artificial colors or flavors are some of the items that Campbell’s Soup Company plans to offer in a bid to attract more today’s more-discerning consumers. The company announced on Wednesday that it plans to eliminate artificial colors and flavors from almost all food sold in North America by August 2018. It will also increase sales of organic foods and remove high-fructose corn syrup from some products. CEO Denise Morrison told the Wall Street Journal that today’s market, where consumers care more than ever about what goes into their food, is "fraught with both peril and tremendous opportunity." "From boomers to millennials, consumers are seeking fresher, less-processed foods," said Morrison. The Camden-based company owns brands like Pepperidge Farm, V8, Prego, and Swanson. In another sign of its emphasis on fresh products, the company has acquired salsa-maker Garden Fresh Gourmet. To increase transparency, the company has created a website called www.whatsinmyfood.com that dives into details about its products that normally wouldn’t show up on a nutrition label.